Fun For The Family All Summer Long! Welcome to the Millheim Pool! The pool at Soldiers and Sailors Memorial Park in Millheim, PA, more commonly known as the Millheim Pool, was built by volunteers in 1970 to provide the families of Penns Valley a safe place to go for summer recreation. The five-acre park is owned by the Millheim Lions Club and maintained by the volunteer Penns Valley Park and Recreation Association, Inc. The park contains the public pool as well as 4 large pavilions available for rental, playground equipment, a basketball court, horseshoe pits and a regulation sand volleyball court in a beautiful setting along Elk Creek. The pool has a six-lane, 25 yard pool with an attached diving well, bath-houses with showers and concessions. 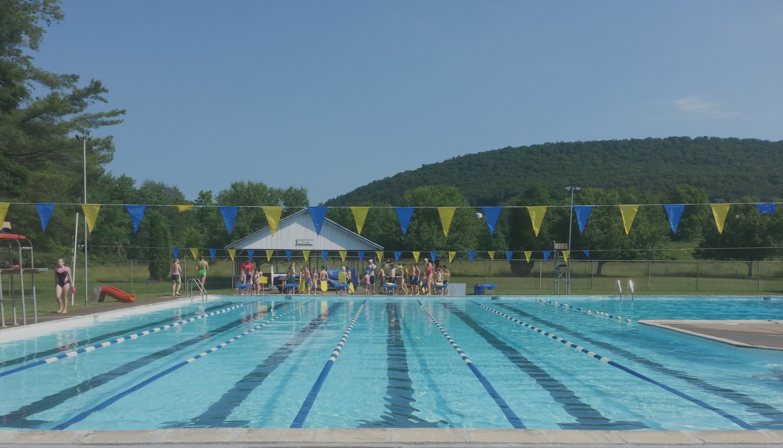 The pool is also the home of the Penns Valley Penguins Swim Team and the location for many summer programs, including swimming lessons, water aerobics, wrestling camp, dinner and movie nights, sand volleyball, scuba and the 7th Annual Millheim Pool Sprint Triathlon, Millheim Mini, and Splash n' Dash Youth Biathlon on Saturday, June 23, 2018. Directions to the Park: The Milllheim Pool at the Soldier's and Sailor's Memorial Park is located just off Park Road in Millheim, PA. From the intersection of Routes 45 and 445 (aka North Street) in downtown Millheim, head EAST on Route 45 until you cross the bridge. Park Road is the first LEFT after the bridge. Follow Park Road until you see the park entrance on your left. Children 3 years and under free with paying patron! if you buy it by May 1. Only $220 for a summer of swimming!